As a Moms Meet Mom Ambassador for Kiwi Magazine, I get the occasional opportunity to sample and review some great natural and organic foods and family products. As a blogger, I was glad that they started their Mom Ambassador Blogger program because now I can share them with you, my reader, and my local natural moms group. Parents who have discovered that they and/or their child have food allergies will be happy to add this kid-friendly cookbook to their collection. 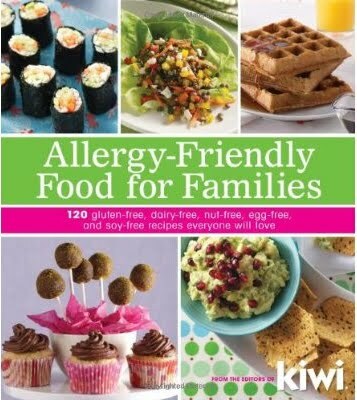 Allergy-Friendly Food for Families is from the editors of Kiwi Magazine and has 120 gluten-free, dairy-free, nut-free, egg-free, and soy-free recipes. My first impression of the cookbook is that it is a good-quality book. Beautiful, full-color pictures printed on thick, sturdy pages in an easy-to-hold 9" x 8" size. It starts out with a brief explanation of food allergies (not sensitivities or intolerances) and a few expert-answered questions. At the back of Allergy-Friendly Food for Families, you'll find a list of products to stock your allergy-free pantry and two recipe indexes, one alphabetical and one by allergen. A special treat waits for you on the last page - a mail-in form for a free one-year (six issue) subscription to Kiwi Magazine! The recipe section is the bulk of the book, of course, and is broken down into Breakfast, Lunch, Dinner, Dessert, Snacks and Parties, each having its own recipe index with an allergy-free key to help you find the right recipe. In addition, there are color-coded "tabs" on the edges of every page to tell you which allergens that specific recipe is free of. These are very helpful as you are flipping through. Sprinkled throughout are pages with ideas for cooking with kids and special tips. One possible negative is that there are not pictures for most recipes. For example, in the Breakfast section, there are 22 recipes and only five with pictures. Personally, I don't have an issue with it, but some might. You're ready to hear about the recipes now, right? Of course, if you have already been cooking for someone with food allergies, you will be familiar with some or most of the ingredients used. Considering that most allergy-causing foods are also the most commonly consumed, like wheat, eggs, and dairy, it is not surprising that their substitutes may be less common. Some of the recipes call for specialty items, like tofu, rice milk, chickpea flour, tahini, or soy-free, non-hydrogenated margarine, but the majority use ingredients found in most grocery stores. You'll find more recipes, articles and tips at their companion website, Allergy-Friendly Cooking. Open to U.S. residents, 18 and older. 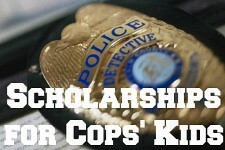 Ends at midnight on Sunday, July 22, 2012. Raising Knights is not responsible for delivery of prize; it will be sent directly from the company. Disclaimer: In exchange for an honest review, I was provided with a free copy of the cookbook for myself and Kiwi Magazine will be providing another copy to the contest winner. I am intrigued by that gluten free pie crust! I had to learn to cook chocolate free for a year - that was challenging - this sounds like a good book for people needing new ways to cook for the family! Both of my boys have food allergies. The older has severe milk and beef allergies. The younger has a mild egg allergy. I'm always on the lookout for new recipes. I would love this cookbook!!!! We have begun the journey in to discerning exactly what is causing my 3 year old's eczema, ear infections, asthma symptoms, constant respiratory issues and a whole host of other problems... She has a pediatric allergist appointment in a couple weeks to test for food/ environmental allergies. I hope I win!!!!! I have two girls with food allergies and this would really help me out! I'm interested in being more cooperative for family members!